Brass for the 480 Achilles is made by shortening .45 Colt brass to an overall length of .900". I start by sizing and depriming the cartridge. Next I cut it with a sharp tubing cutter. 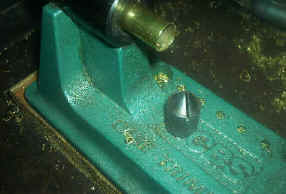 It's easy to hold it in the case trimmer .. but not all tubing cutters will work with your cartridge in the case trimmer. Some are too large to allow you to rotate the cutter all the way around. Once the cartridge is cut I expand the neck with a tapered plug to allow the pilot of the case trimmer to enter the cartridge. 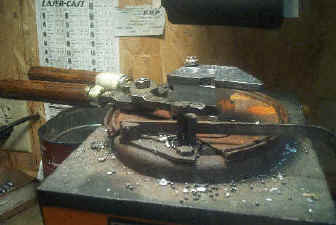 An old .50 caliber machine gun bullet works just fine. With the neck is expanded the cartridge goes back into the case trimmer for final cut to length. When the case is trimmed to length then I chamfer and deburr. The cartridges are now ready for final neck expansion to allow bullet seating. They can then be primed and loaded. So far the only mold we have for the 480 Achilles is the Bittner 480-290-FNH by Mountain Molds. This mold produces quality bullets. The bullets actually shoot better than we thought they would. Or at least "I thought" .... I am kind of a skeptic. Aaron did right well on the design. When I have several hundred bullets cast, I lube them. There are 2 ways to lube heel bullets. One way is to load the bullets into the cartridges with no lube on them. When you are ready to shoot you can then rub a soft lube into the grease grooves of the bullet. Any soft lube such as SPG, Paco's Apache Blue, LBT Blue (soft) or the various Alox blends like Javelina will work. When designing this bullet we made the grease grooves fairly small and lubing that way gives some leading as velocities get over 800/850 fps. Overall, lubing the bullets with Lee Liquid Alox has given me the best results. 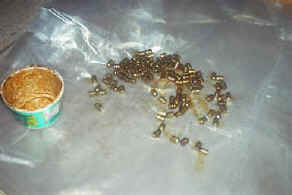 To lube them with the Lee Lube, I take a handful of bullets and dump them into a plastic container. Then I add the Lee Liquid Alox. If you have not used it, just experiment as to how much you need . I usually err on the side of "too much" as in the illustration below. Put the lid on the container, hold on tight and shake it around and up and down and around and around ... hey! A rock 'n roll song! Do that for a few minutes until all the bullets have a good covering of lube. 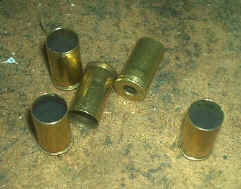 When the bullets are covered with lube, pour them out on plastic sheet and let them dry for 24 hours. They are kinda messy. Even "dry" the Lee Lube is sticky. Especially if you have a lot of lube on them like I usually do. 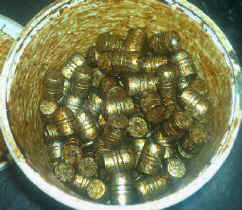 One way to deal with that is, once the bullets have dried, tumble them in White Powdered Mica. This puts a nice slick film over the bullets that not only deals with the stickiness, it helps lube things. You can order the mica from Brownell's easily.